TORONTO — A drive across the American continent takes you through a strange land where the airwaves are full of personal invective mingled with expert analysis of what’s an automatic weapon or semi-automatic or plain old-fashioned pistol or rifle. Say what you want about the political charges and counter-charges flung about in places like Korea and Japan. They’re tame by comparison to the name-calling of the principal contenders for president of the U.S. Examining AR15s in Biloxi, Mississippi. As if the back-and-forth between Hillary Clinton and Donald Trump were not surprising enough, we also have the spectacle of amazing responses to the slaughter in Orlando, Florida, of 49 innocent victims plus the killing of the guy responsible for all those deaths. Every commentator or panelist goes through a ritual of deploring what happened, declaring the fervent need for doing something to keep such a tragedy from recurring — and then proceeds to bicker over demands to ban what the media calls “assault” weapons and figure out who’s a terrorist, who needs to be on a “watch” list, how you tell the bad guys from the good guys. Sometimes, in the deluge of words, you get the impression the protagonists have forgotten what triggered the debate — the worst mass killing by a single person in U.S. history. 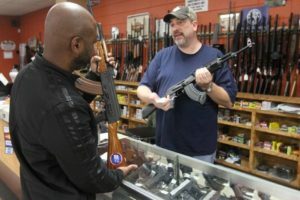 It’s enough to give a return visitor a severe case of culture shock, especially when you visit a gun shop in any town on the way and see all those AR15’s lined up for sale at prices ranging from close to a thousand dollars to two or three thousand apiece. All the more shocking, you hear that well over 3 million of them are floating around the U.S. That’s far more than enough to equip most of the armies of the world with all the rifles their soldiers are likely to need for years of warfare against their worst enemies. At a gun shop in Virginia, I asked, okay, if I get one of these things, how and where would I learn to use it? That seemed like a simple question since anyone capable of firing such a weapon in the armed forces would have to go through weeks of target practice to “qualify” at the range — whether as a top-class expert, a middling sharpshooter or a mere marksman. The initial response was nobody seemed to know, and then a more knowledgeable figure, a manager, emerged to tell me there was somewhere you could practice, but you had to be a member. Most folks just walk out of the shop, after a simple background check, with a most impressive looking AR15, primed to blast away — presumably after a quick read through a manual to see how it actually works. But where had I seen the AR15 before — Looked awfully like the M16’s hefted by U.S. soldiers and marines in places I’d been like Vietnam and Iraq? But haven’t the AR15 — and the M16 — been considerably improved over the decades since Vietnam? I never fired an M16 in Vietnam, but GI’s often told me the AK47, the rifle of bad guys around the world, from the Viet Cong and North Vietnamese to the North Koreans, ISIL, Al Qaida and the Taliban, was superior. The M16 jammed, they complained. “They didn’t clean it properly,” the manager told me. The AR15, and the M16, he said, were far more accurate at 500 yards. Should be great for killing coyotes and other varmints. If the AK47, which stands for Avtomat Kalashnikova 1947, the year a Russian named Kalashnikov invented it, is called “automatic,” then so is the AR15 — the “AR” standing not for “assault” or “automatic” but for Armalite, the name of the original manufacturer. Any weapon that can fire 30 rounds with a single prolonged press of the finger is automatic by the definition of Kalashnikov, who would not have called his weapon “Avtomat” if he had seen it as anything less. The debate advances from sublime to ridiculous with gun enthusiasts gleefully pointing out that the “media” had it all wrong, that the Orlando killer, Omar Mateen, didn’t have an AR15 at all — rather, he was firing a Sig Sauer MCX. So Mateen was lucky to have a Sig Sauer MCX, and the unlucky ones were the 49 whom he killed and the dozens he wounded in the nightclub the Pulse. As for who should carry such fearsome weapons and how many millions should be on an FBI “watch list” and ineligible to buy them, those are the types of questions we’ll hear time and again — until the next such shooting and the one after that. Such is the level of debate in this strange land more than a week after the slaughter. WorldTribune.com columnist Donald Kirk, who has been covering war and peace in Asia for decades, has been driving across the U.S. He’s up in Canada at this writing, reachable at kirkdon4343@gmail.com.